Do you Eat Popcorn and Drink Coca Cola at the Movies? Yesterday, my wife and I went to see the movie, “The Spy Who Dumped Me”, with Mila Kunis and Kate McKinnon. As usual, most people entered the cinema hall with huge baskets of popcorn and Coca Cola. When the movie started, I could hear the funny sound of crunching the popcorn all over the cinema hall. I came to see a movie, not to listen to a concert of chewing popcorn. I could tell the people around me to eat a little quieter, but I chose not to say anything. Why I chose not to say anything? If the owners of the cinema hall choose to sell popcorn and Cola, it means that they allow people to eat and drink during the show. Eating popcorn is the standard activity in all movie halls when watching a movie. This is the common rule, and you can therefore, say nothing about it to anyone. If you dare to comment about the noises people are making when eating the popcorn, they might not understand what you want from them, because they are sure this is allowable. I too, sometimes eat popcorn at the movies, but rarely, and only a small quantity. True, when watching a movie you want to be completely absorbed in the plot and not have your focus disturbed by background munching sounds, but that is not always possible. You know what? Since you hear the sound of chewing at every movie, you get used to it and start ignoring it, if it is of course, not too loud. What puzzles me is how could people fill their stomach with so much popcorn? Yes, it is tasty, and it produces a pleasant sensation in the mouth. 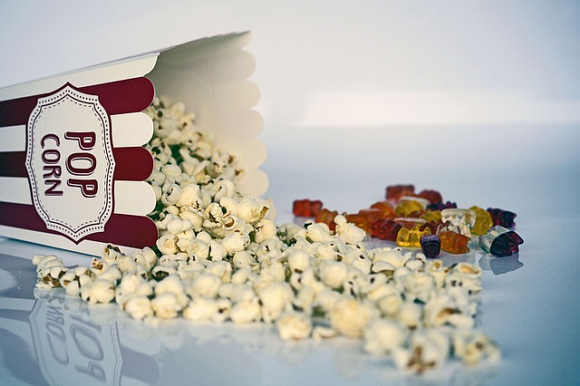 If you eat just a little, well, it is okay, but often it is a huge quantity of popcorn. Does the body need it? Is it nourishing and healthy? No, of course it isn’t. Suppose you fill the tank of your car with popcorn instead of fuel, will you do that? Of course, you will not do that. I am not telling you to stop eating popcorn. I am only talking about eating a reasonable quantity. It is important that you pay attention what you put into your mouth. If something is tasty, this does not mean that you should be addicted to it. You should be the one controlling your desires, habits and what you eat, not your taste buds. Actually, this applies to every kind of food. If you wish to maintain health and a healthy weight, you need to be careful of what you put into your mouth. A little self-discipline would be of great help. When you eat something delicious, you should know when to stop. Ice cream, cakes, popcorn and snacks are tasty, but if you want to be healthy and look good, you need to learn to eat less of them. Do You Like Who You Are, or Do You Want to Be Someone Else?